Welcome to Tronster.net: OFF DAY!!! The weather here in town has been trying to usher in spring. Last week, there was a good day, Wednesday, I took the day off to get the windows tinted on the Subaru. (Don't laugh, it has a turbo). LA Tint, in Manassas is not only convenient, it has a good price. 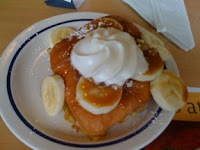 IHOP is right across the street. (That is why I consider it Convenient.) So I drop off the car and get some breakfast. They are having their stuffed French Toast special again. WOW, is this stuff good.